Two drivers are lucky to have survived a four vehicle accident the afternoon of Thursday March 23, 2017. 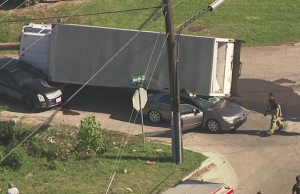 According to Channel 13 News, a flatbed hauling some pipe was traveling the 600 block of Blue Bell Road when it struck the rear of a large white box truck, causing the box truck to make an out-of-control turn and topple over onto two passenger cars. 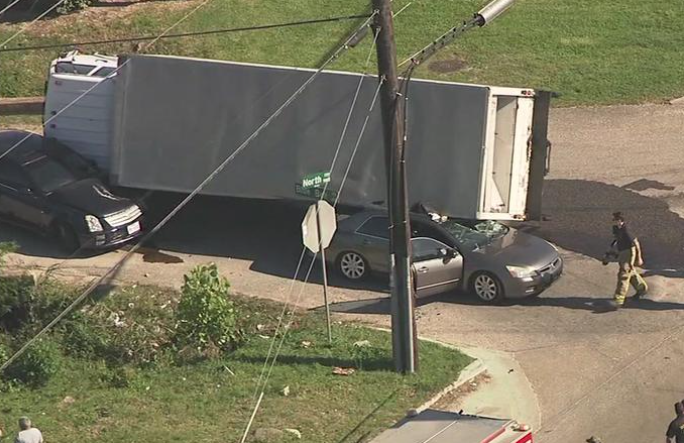 The box truck partially crushed a gold colored Honda and a dark-colored Cadillac behind it. Accident witness Mr. Cruz Hernandez told Channel 13 that a female existed the Honda bleeding from her head, and the Cadillac driver was up and moving after the crash. Both were taken to the hospital to be checked out. The box truck driver wasn’t hurt in the crash, and the driver of the flatbed truck who cause the accident is going to be issued a citation for failure to control speed. This entry was posted on Friday, March 24th, 2017 at 9:37 am and is filed under 18-wheeler accidents, Accident Lawyer, Auto Accident, Personal Injury.